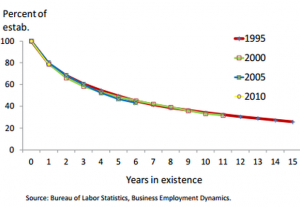 The latest Bureau of Labor Statistics states that roughly 80% employees survive past their first year of operation. However, around half of all businesses no longer exist after five years. Only one-third make it past their tenth anniversary. One of the major causes for business failure is attributed to the lack of coherent business strategies. The right strategies and controls in place greatly help a business avoid failure and set it on the path towards long-term success and helps organizations to define and maintain competitive advantage. Please share your insights and let us know which of these business strategies is working best for your company. Jeff Bezos is the third richest person in the world with a net worth of $72.8 billion. He is the founder and CEO of Amazon.com and the owner of ‘The Washington Post’. What started in his garage with a couple employees went on to become the multi-billion dollar company, Amazon. Here are six top business strategies from Jeff Bezos that can save you years of failure. 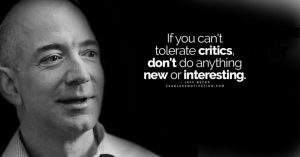 According to Bezos, you should be stubborn on the vision but flexible on the details. Being stubborn is essential because it makes you persevere when experiments don’t work and you realize that if you keep going, things will work out. And flexibility is important to discover new and creative solutions that won’t come your way if you have a fixed mindset. In other words, on a macro level, you should be stubborn, but on a micro level, you should be flexible. This is one of the top business strategies you can adopt.